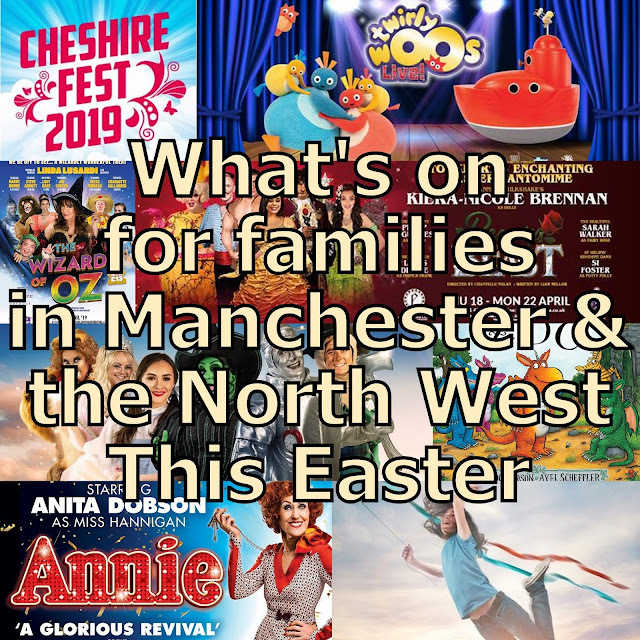 Fudge is something that's really expensive to buy and incredibly popular, but actually not too hard to make yourself, and if you do, then you can flavour it with whatever you choose. I had to provide a Secret Santa present at the weekend for the gorgeous and very lovely Tami from Mummy Of Two. Our budget was a fiver, and I decided I wanted to make her something nice. I've not made fudge since last Christmas, but it instantly came to mind. I'd seen a very simple recipe using condensed milk on the Carnation website, so I used that. You will also need a 20cm square tin lined with baking paper - I found actually that gave a really fairly deep fudge, although it really doesn't matter as you'll usually cut it up to suit anyway. All of the ingredients go into a saucepan together - non-stick is best, but I don't have one and mine was absolutely fine. Heat until dissolved, stirring all of the time to stop it burning. Bring to the boil and then simmer gently. 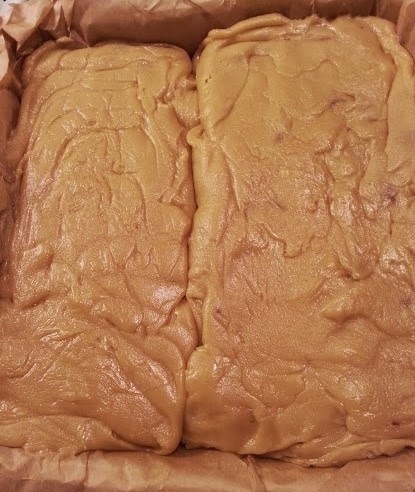 The recipe says 10-15 minutes, but actually I found when I simmered it for 15 minutes it ended up very dry and a bit crumbly, although quite like Scottish tablet. My second batch I simmered for around 5 minutes and stopped when it reached a good thick consistency that was still slightly syrupy. You MUST stir it carefully right to all of the corners the entire time or it'll just burn to the pan. 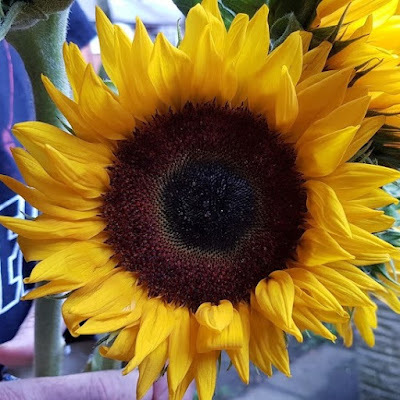 Be really careful not to splash as the sugary mixture is incredibly hot, will immediately stick to your skin and makes for a nasty burn. 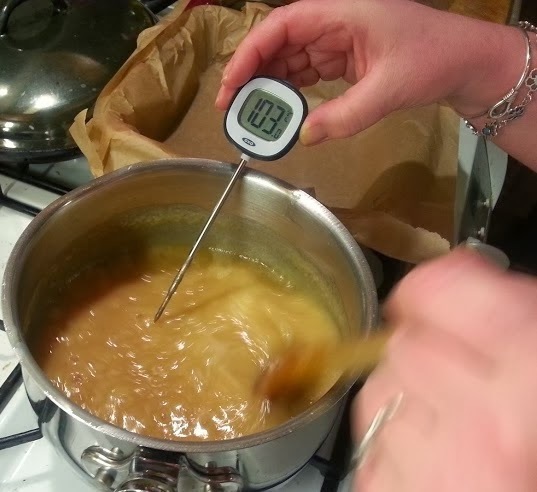 For fudge to work properly it has to be heated to 118 degrees. 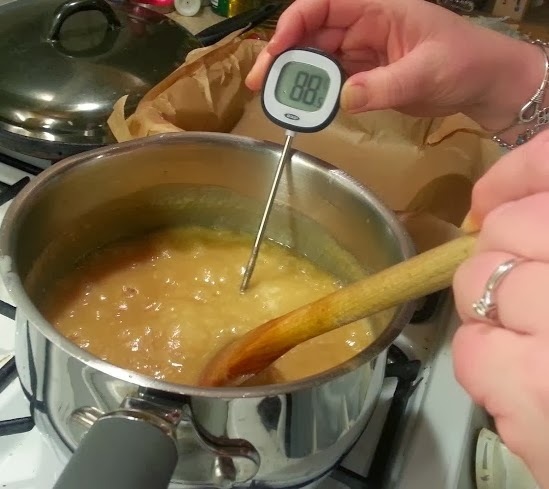 You can test that it has heated enough by dropping a small drop into cold water, where it should form into a fudgey ball, but it's easier with a thermometer. 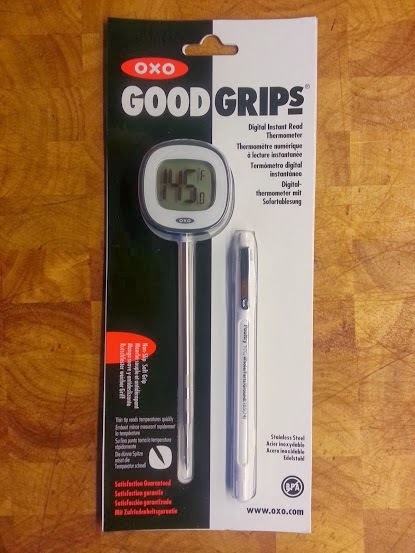 I'm using the Good Grips thermometer from Oxo. 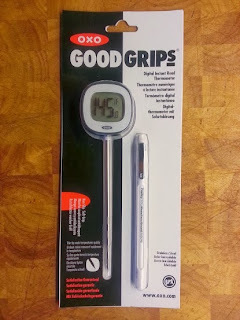 I chose a very specific Digital Instant Read Thermometer as it has a huge temperature range (from -40 degrees to 302 degrees F / -40 degrees to 150 degrees C) and is therefore suitable for meat as well as jams and fudge. After your fudge has heated enough and you've simmered it, stirring all of the time, comes the hard work. To make your fudge creamy and light you now need to beat it. 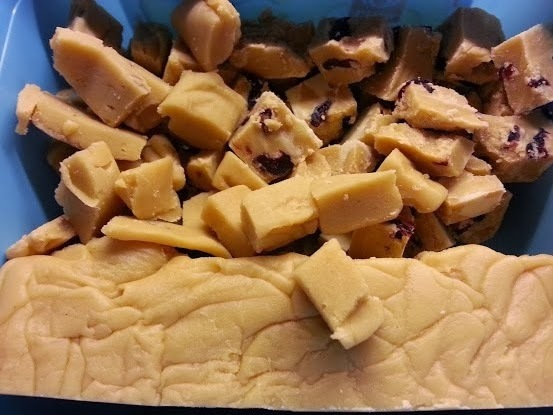 The better a job you do here, the smoother your fudge will be. It's a good workout for your arms! 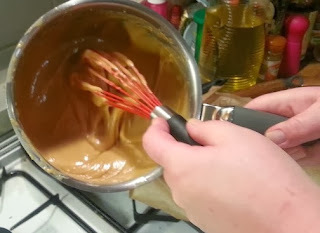 To make life easier, and the job much quicker, you can actually swap your wooden spoon for a balloon whisk - I was previously sent an Oxo Silicone Balloon Whisk which can withstand temperatures of up to 600oF/315oC, so it's perfect for the job. Because it's silicone, it's also incredibly easy to clean - the cooled fudge just falls off when you shake the whisk or tap it on the counter. 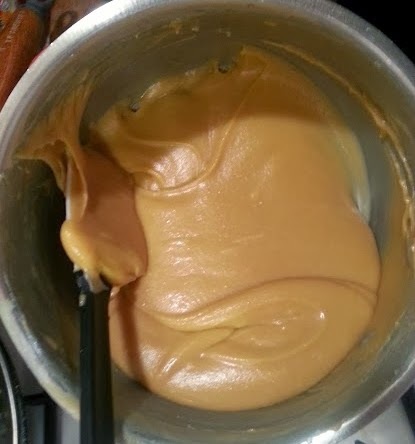 When your arms feel like lead weights and the fudge is fudgey but still pourable is time to add any extras before pouring it all into your lined tin and smoothing the top and putting to set. To my first batch I added dried cranberries and white chocolate. The chocolate is going to melt, so it's easy to stir into your fudge, not so easy to leave chunky. I tried lining my tin with chunks of chocolate and then when the fudge had cooled enough I jabbed chunks into it. 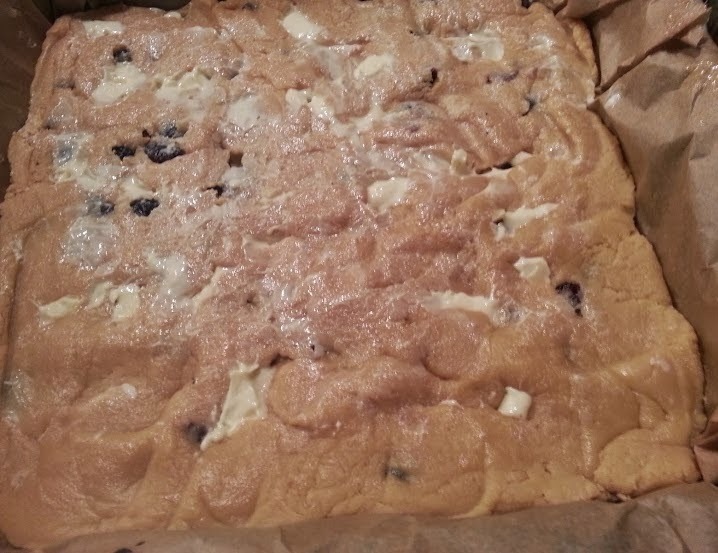 It doesn't look very neat and didn't really work, not exactly a success, but certainly not a failure - after all it's fudge and white chocolate however it's presented! To my second batch I added a teaspoon of vanilla paste - the equivalent of around 1 vanilla pod. I split it and added chopped pecans to one half, leaving the other half nut free in case Tami wants to give any to her little one. Because this fudge was cooler by the time I poured it into the tin it was virtually impossible to get a neat surface, but as I'm cutting it up you'll never tell. 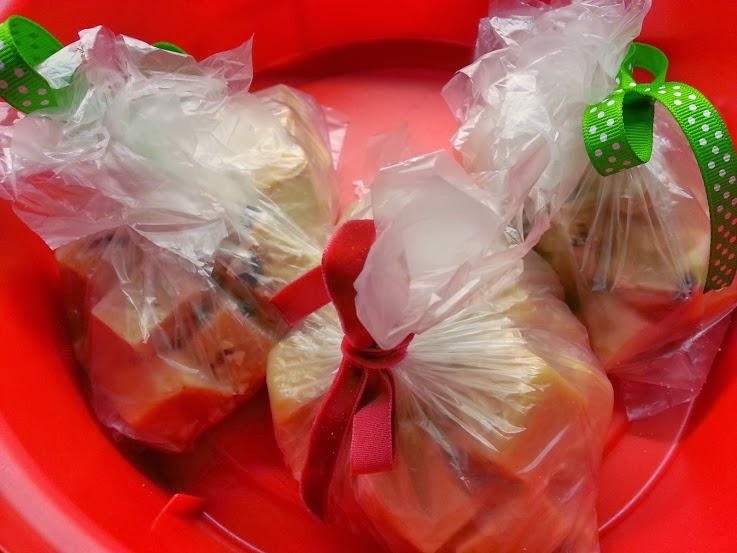 Fudge will keep at it's best for around 3 weeks in a cool place in an airtight container - so it makes an excellent Christmas gift, but don't make more than a few days before you gift it!